I planted a 16 foot row of the indeterminate (tall-growing, must be staked) “Mister Big” shelling peas from West Coast Seeds. The shelling peas are planted along side our front yard deer fence, which is made of wood and wire. Those plants will be able to grow almost 7 feet tall with plenty of support from the mesh and arbor above. 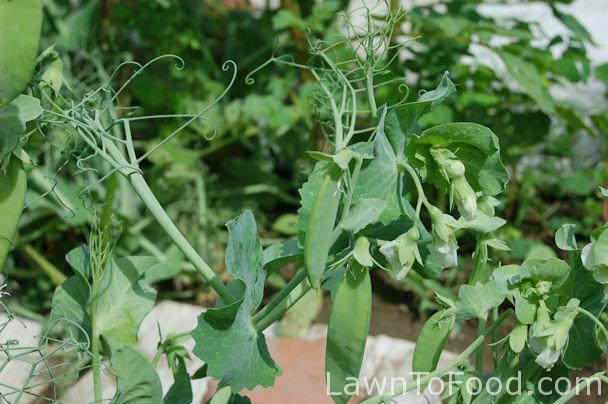 I also planted determinate varieties of snow peas and snap peas that will not grow more than 24″ to 36″ tall. For the shorter, bushy type snow and snap peas, I didn’t need 7′ of vertical trellis to support them, but did want to keep them up off of the ground. I searched Pinterest for pea trellis, and found some very cool ideas. Unfortunately, most images for the short growing peas, were clunky chunks of pallet wood or brightly colored plastic trellis options. Neither of those types fit in with my vision of a plastic-free-natural-setting organic vegetable garden. 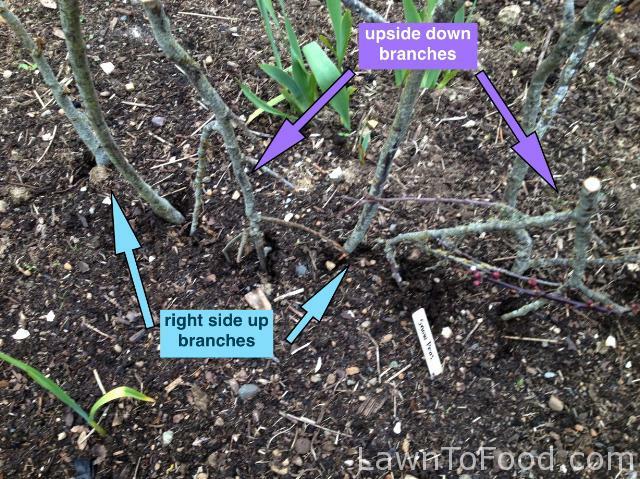 So instead, I decided to adapt a twig trellis diagram, to suit my snow and snap pea crops this year. I grabbed my pruning shears, gloves, our three dogs and jumped into the truck. Off we went in search of the best sapling branches, to create a twig trellis masterpiece! Ya so … that didn’t quite work out. I discovered that most straight, thin saplings grow in deep, deep roadside ditches or on someone’s private property 🙁 Just as I was about to give up on the twig chase, I found a pile of dumped branches on a deadend road. Score! I gathered up a load of the branches, whist the dogs ran through the woods looking for the Easter Bunny. They came back empty handed, but I did not. 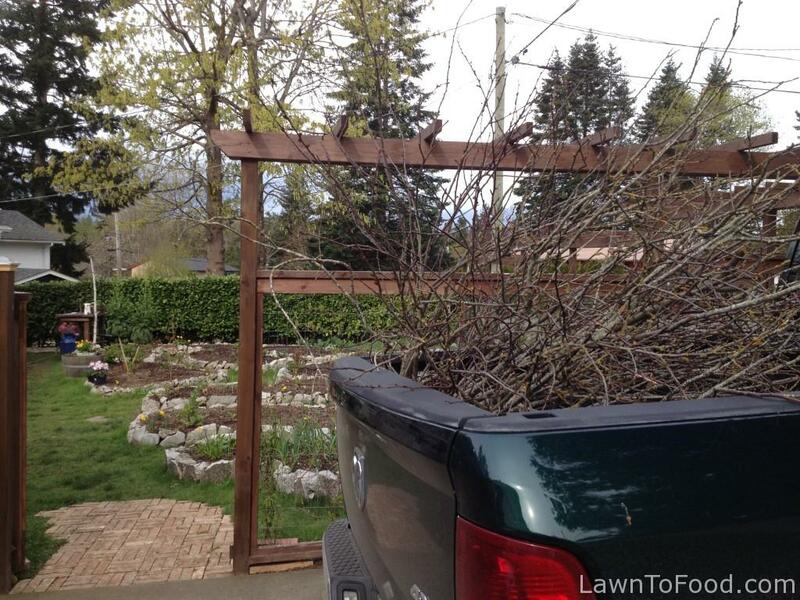 Truck load of branches for twig trellis project. I started by trimming a few 4′ foot tall twigs, so that they were 2 dimensional. Keeping the left and right branches but removing the front and back ones, so that they could be placed in a row. I also trimmed all of the branches off of the lower 10 inches, and then pushed each stock into the ground about 8 inches deep. I trimmed some short, top ends to place into the ground upside down. The tops will provide plenty of tiny twigs for the young peas to grab after sprouting. In the next step, I wove some branch-less twigs horizontally through the vertical stalks. I used some twine to tie the twigs together where they crossed. I was surprised at the amount of stability this provided for the whole trellis. 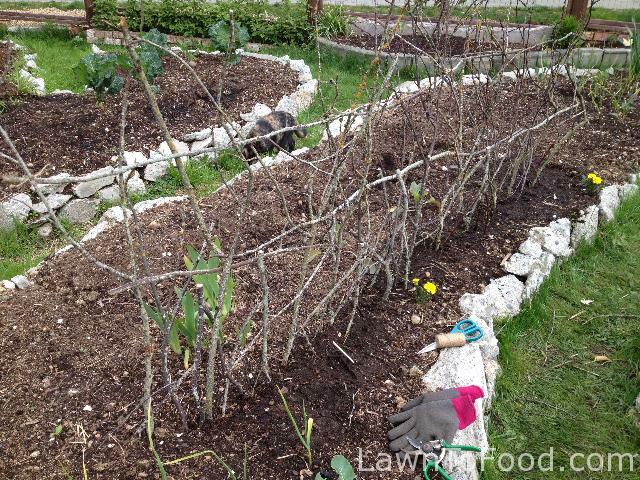 I wove in two rows of horizontal branches on this 10′ foot long trellis. 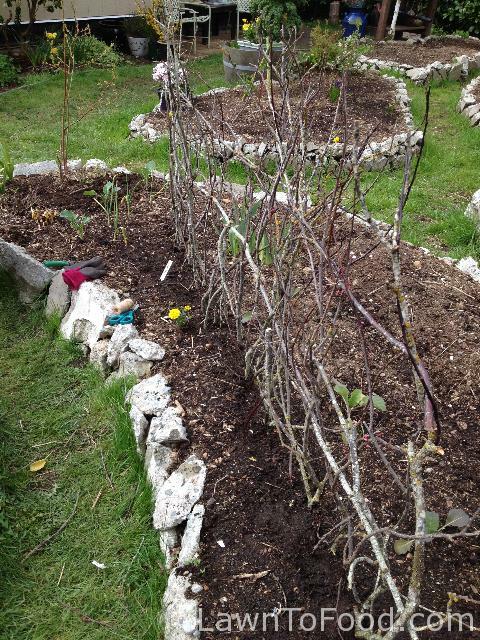 For the second one, near the strawberry patch, I used 3 horizontal branches to support the taller twigs, that make up this trellis. I am very pleased with the natural, whimsical look of these twig trellises. They didn’t take much time to complete, they were built with discarded material and they cost nothing, except a couple of feet of twine. ~win~win~win~ I am looking forward to seeing them covered with pea tendrils in the next few months. 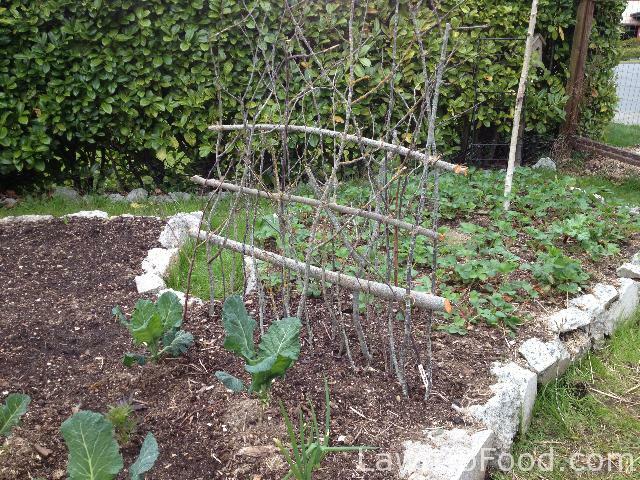 This entry was posted in Cool Carpentry Ideas, Projects, Recycle Reuse Rebuild and tagged branches, peas, trellis, twig by Lynda. Bookmark the permalink.